The year has got off to a flying start as we’ve once again created the news on New Years Day with the unveiling of the designs that will grace the circulating coins of Great Britain in 2016. 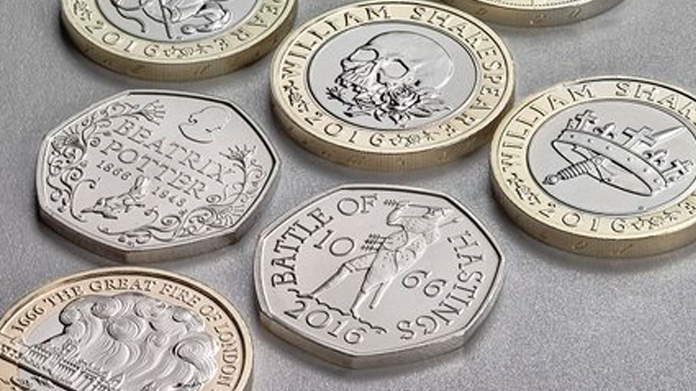 Marking anniversaries including the Battle of Hastings, Shakespeare, Beatrix Potter and the Great Fire of London, the first showing of the coins has become an annual institution (thanks in no small part to the team’s work in 2015 and 2014). Anyway, the idea (as always) is to inspire the nation to pay a little more attention to the pounds and pennies in their pockets and take note of them a little more. At the same time to tell the story of the remarkable team of designers, engravers and engineers that put those coins there. The story, in other words, of The Royal Mint, a Great British institution and brand. Thanks to some top class publicity skills, we’ve awoken this morning to coverage across most of the BBC (including the main hourly radio news, the Today Programme and BBC News Online) as well as ITV and Sky News (TV and radio network news). Alongside there was a sweep of coverage across Daily Mail, Daily Mirror, The Sun, Metro, Daily Telegraph, Independent, Herald, Daily Record, The Huffington Post and literally hundreds of regional pieces. Giving monetary value to our history is an inspired and enduring way to remind us all of our heritage. Anniversaries come and go, and leave behind them some freshly planted trees, posters and history kits to decorate our classrooms, mugs mass-produced in China and occasional doggerel by the poet laureate. But a coin’s eternal image shall not fade, however many grubby hands soil its surface … we must surely welcome the decision to fix our history not just with an ephemeral stamp but in enduring bronze. A spot of New Year’s Eve pitching that has more than paid off.